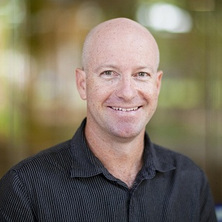 Professor Darren Martin is the Chief Scientific Officer for start-up company TenasiTech Pty Ltd, which is commercialising a polymer nanocomposites platform as applied to large polyurethane and acrylic polymer markets and applications. TenasiTech is the first Queensland start-up to receive Commercialisation Australia funding; has won the prestigious iLab Prize in the national Enterprize Competition; and received the 2010 UQ EAIT Commercialisation award. Professor Martin’s research operates at the nexus of three key themes; (1) Strong fundamental materials science with global benchmarking; (2) Safe biomaterials and nanomaterials; (3) Scalable advanced manufacturing. His efforts in these areas during the past two decades have contributed to two successful start-ups, numerous products and a strong platform for globally competitive nanocomposites innovation. Professor Martin’s international collaborators include Pennsylvania State University; Purdue University, US; Queen’s University Belfast, UK; Institut national des sciences appliquées de Lyon, France; and the University of Padova, Italy. He also has several materials co-development projects and collaborations with companies such as Cochlear Ltd, Aortech Biomaterials, and several others in North America, Europe and Asia. Professor Martin has been the recipient of three Australian Research Council (ARC) Discovery Grants and has secured more than $9 million in research and commercialisation funding since 1999. He has two granted patents and two provisional patents in these areas. He is working with Australian regulators such as NICNAS and WorkSafe Australia on policy for nanomaterials/nanocomposites safety and occupational hygiene. Professor Martin is a member of the Engineers Australia Nanoengineering panel and has presented more than 10 keynotes or invited lectures. During the past five years a large proportion of his research funding has been derived from the private sector. Polymer nanocomposites and nanotoxicology. Polymer nanocomposites fundamentals and discovery, scale-up, product co-development, specification and commercialisation. Renewable-based polymer nanocomposites and advanced materials. Professor Darren Martin is the Chief Scientific Officer for start-up company TenasiTech Pty Ltd, which is commercialising a polymer nanocomposites platform as applied to large polyurethane, acrylic and other polymer markets. Co-development partnerships with several companies are rapidly approaching the product specification stage. Applications include elite sporting goods, durable rubber engineering components and building products. Longer-term horizon work also continues on more reliable medical device components. More recently Professor Martin's team have developed a novel nanocomposite platform totally based on renewable materials. Professor Martin is working with Australian regulators such as NICNAS and WorkSafe Australia on policy for nanomaterials/nanocomposites safety and occupational hygiene. This activity is critical for the responsible development and translation of new nanomaterials. Polymer nano composites for advanced gas barrier applications. Ladewig, Bradley, Martin, Darren, Diniz da Costa, Joao C. and Lu, Gao Qing (2011). Nafion® nanocomposite membranes for direct methanol fuel cell. In Hari Singh Nalwa (Ed. ), Encyclopedia of nanoscience and nanotechnology (pp. 503-515) Valencia, CA, U.S.A.: American Scientific Publishers. Martin, Darren (2018) Preface. Materials Science Forum, 923 MSF . Can clay nanoparticles accelerate environmental biodegradation of polyolefins? Rivera, I., Martin, D J and Truss, R W (2006) Visoelastic studies on thermoplastic polyurethane nanocomposites using a nano-hardness tester. Journal of Polymer Engineering, 28 8-9: 903-918. Ladewig, B. P., Webb, R. E., Martin, D. J., Diniz da Costa, J. C. and Lu, G. (2005) Preparation and Characterisation of Nanocomposite Nafion-Functionalised Silica Membranes for Direct Methanol Fuel Cell Applications. Brazilian Journal of Materials Science and Engineering, 7 51-59. Jeong, S., Martin, D. J. and Lu, M.G. (2002) Preparation and characterization of polymer/layered silicate nanocomposites. Current Topics in Colloid & Interface Science, 5 69-81. Poole-Warren, L. A., Martin, D. J., Schindhelm, K. and Meijs, G. F. (1997) Polymeric biomaterials. Materials Forum, 21 241-256. Kȩpa, Katarzyna, Amiralian, Nasim, Grøndahl, Lisbeth and Martin, Darren (2018). Exploring the interactions that drive the cellulose nanofiber assembly in nanopaper derived from Australian arid grass. In: International Conference on Nanotechnology for Renewable Materials 2018. 2018 TAPPI International Conference on Nanotechnology for Renewable Materials, Madison, WI, (48-54). June 11, 2018-June 14, 2018. Hamid, Asna Rasyidah Abdul, Osman, Azlin Fazlina, Martin, Darren, Daud, Yusrina Mat, Abdullah, Mustafa Al Bakri and Ghazali, Che Mohd Ruzaidi (2017). Effect of dispersant concentration on morphology of the ultrasonicated organically modified montmorillonite. In: Proceedings of Mechanical Engineering Research Day 2017 (MERD). 4th Mechanical Engineering Research Day (MERD), Melaka, Malaysia, (354-355). 30 March 2017. Humphry, Jarrad, Vandi, Luigi-Jules, Martin, Darren and Heitzmann, Michael Tobias (2017). Time-temperature transformation modelling for the in situ processing of thermoplastics as a composite matrix. In: Twenty-Fifth International Conference on Processing and Fabrication of Advanced Materials (PFAM-XXV). International Conference on Processing and Fabrication of Advanced Materials (PFAM), Auckland, New Zealand, (). 22-25 January 2017. Septevani, Athanasia Amanda, Annamalai, Pratheep Kumar , Evans, David and Martin, Darren J. (2015). Optimisation of thermal insulation of cellulose reinforced rigid polyurethane foam using Taguchi methodology. In: European Polymer Congress EPF 2015, Dresden, Germany, (). 22-26 June 2015. Mohd Amin, Khairatun Najwa, Annamalai, Pratheep Kumar and Martin, Darren J. (2014). Isolation of cellulose nanocrystal with improved thermal stability from commercial crystalline cellulose. In: NanoBio Australia 2014: 5th International NanoBio Conference & 3rd International Conference on BioNano Innovation (2014 ICBNI), Brisbane, (). 6-10 July 2014. Mohd Amin, Khairatun Najwa, Annamalai, Pratheep Kumar and Martin, Darren J. (2014). Processing of polyurethane-cellulose nanocomposites via reactive extrusion. In: 10th SPSJ International Polymer Conference (IPC2014), Tsukuba, Japan, (). 2-5 December 2014. Septevani, Athanasia Amanda, Annamalai, Pratheep Kumar and Martin, Darren J. (2014). Synthesis and characterisation of polyurethane foam from palm-based polyol. In: NanoBio Australia 2014: 5th International NanoBio Conference & 3rd International Conference on BioNano Innovation, Brisbane, (). 6-10 July 2014. Musumeci, Anthony W., Gahan, Lawrence R., Rajh, Tijana, Martin, Darren J. and Smith, Suzanne V. (2010). Radiolabelling of TiO2 nanoparticle libraries for toxicological investigations. In: Business and Safety Issues in the Commercialization of Nanotechnology. 2009 MRS Fall Meeting, , , (157-162). November 29, 2009-December 2, 2009. De Silva, D. Sujeewa M., Memmott, Paul, Flutter, Nick and Martin, Darren (2009). Characterisation of spinifex (Triodia pungens) resin and fibres. In: Conference Abstracts: 11th Pacific Polymer Conference. PPC11: Progress in Polymers for the New Millennium. 11th Pacific Polymer Conference 2009 incorporating the 31st Australasian Polymer Symposium, Cairns, QLD, Australia, (). 6-10 December 2009. Aparna Jejurikar, Lawrie, Gwendolyn A., Martin, Darren J. and Grondahl, Lisbeth (2009). Improved alginate based hydrogels for articular cartilage replacement. In: Proceedings of the 8th World Biomaterials Congress. 8th World Biomaterials Conference, Amsterdam, Netherlands, (). 28 May 2008 - 1 June, 2008. Ladewig, B. P., Martin, D. J., Diniz da Costa, J. C. and Lu, G. (2005). Nafion Composite Membranes for Hydrogen and Methanol Pem Fuel Cells. In: S. Pratt and C. Davies, APCSEET 2005. APCSEET 2005, Wellington, New Zealand, (196-200). 8-11 May 2005. Rodriguez, J. I. C., Ladewig, B. P., Dicks, A. L., Duke, M. C., Martin, D. J., Lu, G. and Diniz da Costa, J. C. (2005). Nanocomposite Nafion-Silica membranes for direct methanol fuel cells. In: World Hydrogen Technologies Convention. World Hydrogen Technology Conference, Singapore, (1-8). 3-5 October, 2005. Simmons, A, Hyvarinen, J, Odell, R A, Gunnatillake, P A, Martin, D. J., Noble, K R and Poole-Warren, L A (2004). Long term in vivo Biostablity of Poly(dimethylsiloxane)/Poly(hexamethylene oxide) Mixed Macrodiol-based Polyurethane Eastomers. In: J Ramshaw, Transactions of the 7th World Biomaterials Congress. 7th World Biomaterials Congress, Sydney, Australia, (1862-1862). 17-21 May 2004. Styan, K., Martin, D. J. and Poole-Warren, L A (2004). Polyurethane-organosilicate nanocomposites for biomedical use. In: J. Ramshaw, Transactions of the 7th World Biomaterials Congress. 7th World Biomaterials Congress, Sydney, Australia, (1283-1283). 17-21 May, 2004. Styan, K., Martin, D. J. and Poole-Warren, L. (2003). Cell grown inhibition assay of polyurethane-organosilicate nanocomposites. In: 26th Australasian Polymer Symposium. 26th Australasian Polymer Symposium, Noosa, Queensland, Australia, (1-1). 13-17 July 2003. Ladewig, B. P., Martin, D. J., Diniz da Costa, J. C. and Lu, M.G. (2003). Nanocomposite nafion/silica membranes for high power density direct methanol fuel cells. In: 5th International Membrane Science & Technology Conference. 5th International Membrane Science & Technology Conference, Sydney, NSW, Australia, (1-5). 10-14 November, 2003. McNally, T., Martin, D. J., Murphy, J.M. and Lemoine, P. (2003). Polythylene multiwall carbon nanotube composites by melt blending. In: 26th Australasian Polymer Symposium. 26th Australasian Polymer Symposium, Noosa, Queensland, Australia, (1-1). 13-17 July 2003. Campbell, K., Martin, D. J. and Whittaker, A. (2003). The analysis of segmented polyurethane nanocomposites by NMR and microscopy. In: 26th Australasian Polymer Symposium. 26th Australasian Polymer Symposium, Noosa, Queensland, Australia, (). 13-17 July, 2003. (2004) Aortech Biomaterials Pty. Ltd.